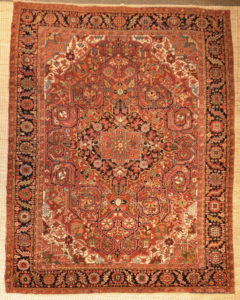 The tradition of Persian rug weaving dates back more than 3,000 years. 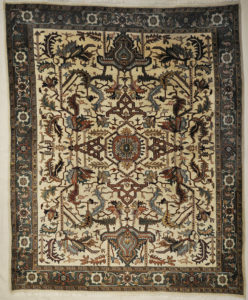 These Heriz carpets are named after the largest town in a district of over 30 villages, in the mountainous area of Northwest Persia, 50 miles east of Tabriz. 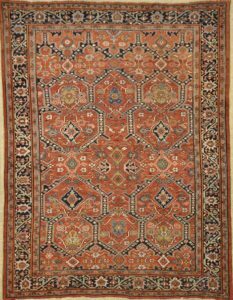 The better semi-antique and antique Heriz rugs used the lustrous wool from the Shahsavan, a nomadic tribe residing in the nearby Elbrus Mountains. According to written records, the King of Persia commissioned an unprecedented carpet decorated with crystals, gemstones, and precious metals in the 6th Century. 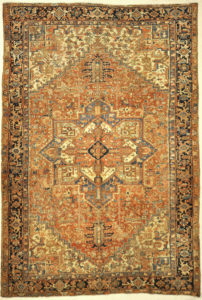 However, the tradition of Heriz and Serapi rugs is relatively recent. 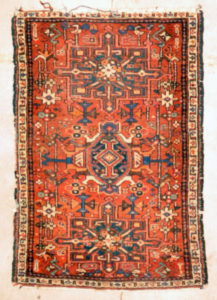 Historically, it was common for traders of antique rugs to market carpets produced in neighboring villages, responsible for Bakshaish rugs, as Heriz. 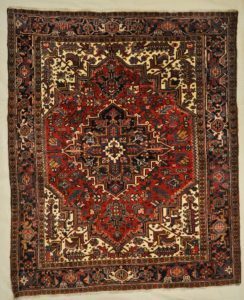 Older antique Heriz rugs, echoing the famous antique Serapi Carpets from the same district, tend to be more spacious in design, while the Heriz rugs woven in the last 60 years tend to be more densely designed. Other formats more rarely seen include allover flower or leaf antique carpet designs and occasionally a Tree of Life motif reminiscent of some antique caucasian and dragon rugs. 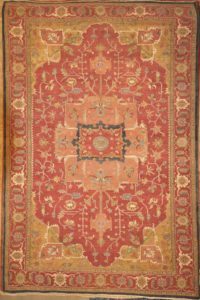 With distinctive large-scale motifs and a wide ranging palette of warm colors, the antique Heriz carpet is probably the most popular of the Persian village carpets. 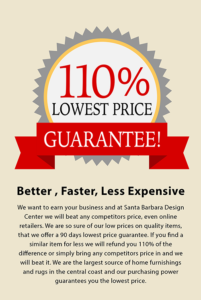 In constant, increasing demand for the past decades, the finer old pieces have become scarce and have risen significantly in value and esteem. The inception of the classic “diamond on a square” medallion Heriz was probably in the third quarter of the nineteenth century. 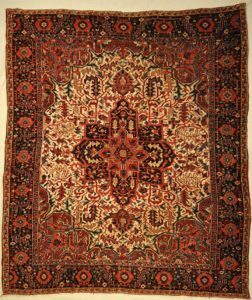 It is believed that enterprising Tabriz merchants, wanting roomsize Persian carpets for export, showed local weavers the fine city rugs or maybe even scraps of fabric and asked them to weave large carpets. They are hand-knotted, employing a thick, sturdy cotton foundation with tightly packed knots, making for their well-known durability. 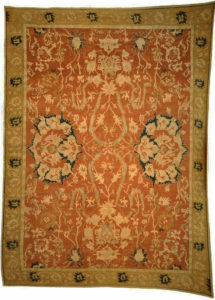 The weavers, skilled in the more spontaneous and angular weaving of tribal origin, adapted these antique carpet designs. 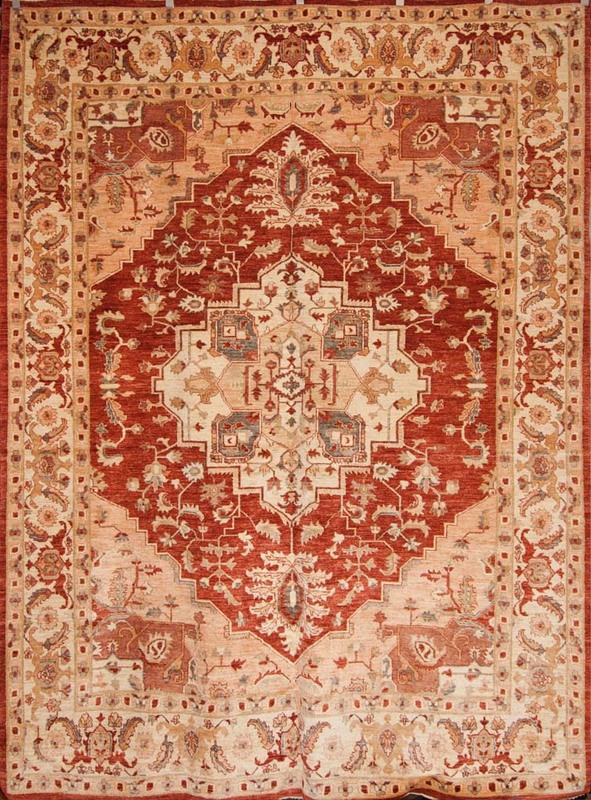 The result, the Heriz Rug, is a marvelously effective hybrid, a rustic, charming village carpet with a richness and grandeur equal to the Persian court pieces. 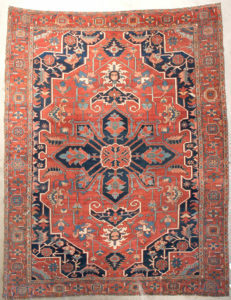 Come and stop by our gallery to find Fine Antique Sultanabad carpets at 410 Olive. 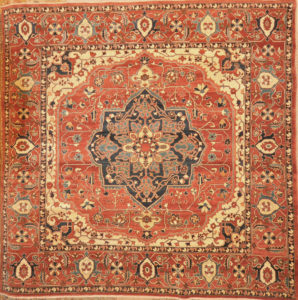 This antique Heriz rug is named after the largest town in the mountainous area of northwest Persia. 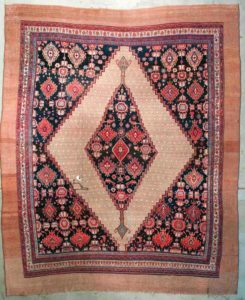 It is said that Tabriz merchants who wanted room size carpets for export asked weavers to make rugs modeled after scraps of fabric. 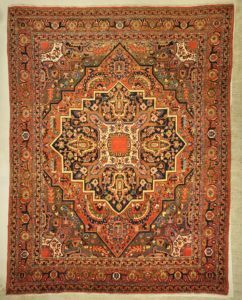 The result is the Heriz carpet, which is an stunning hybrid of rustic village weaving along with a rich grand Persian court piece. Heriz are produced in the village of the same name in the slopes of Mount Sabalan. Heriz rugs are one of the most famous rugs from Iran, because of their very unique and distinguishable style. 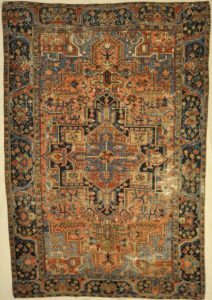 Antique Heriz carpets are prized for their elegant patina and rich colors that are often attributed to the area’s copper-rich water. Regal terra-cotta reds, clear Persian blues and creamy accent colors are synonymous with the region’s unmistakable coloration. 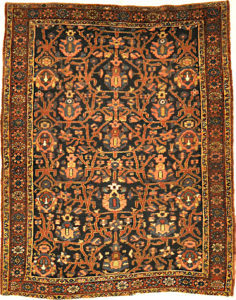 Rare Antique Heriz Rug are produced in the village of the same name in the slopes of Mount Sabalan. Heriz rugs are one of the most famous rugs from Iran, because of their very unique and distinguishable style. 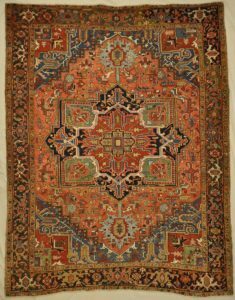 This is a lovely rare Antique Heriz Juval with distinctive large-scale motifs and a wide ranging palette of warm colors, the antique Heriz carpet is probably the most popular of the Persian village carpets. 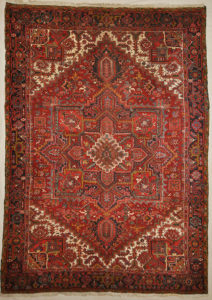 Persian Heriz Rug are produced in the village of the same name in the slopes of Mount Sabalan. Heriz rugs are one of the most famous rugs from Iran, because of their very unique and distinguishable style. A wonderful antique with a strong tribal motif. 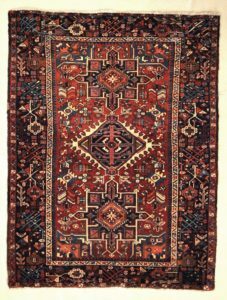 Prized for their strong geometric style, fine construction and rich colors, the carpets of Heriz, Serapi and Bakshaish are regional cousins that share mutual origins. 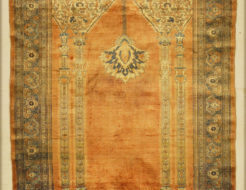 Our Fine Serapi Heriz is considered one of the most desirable of room size decorative carpets found in the market today. These works of art are woven in a distinct style that is found in the Heriz region. The larger scale and spaciously placed designs are what differentiates these carpets from others. For years, Antique Serapis have been the carpet of choice in early American state and federal buildings, including the White House. 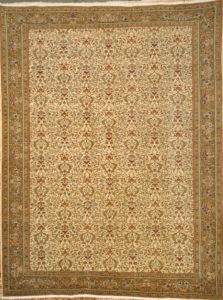 elegant, softly colored and richly patterned carpets continue to attract new generations of consumers and collectors. Finest Rare Antique Serapi Heriz made of natural wool. Finest persian rug from west Iran. 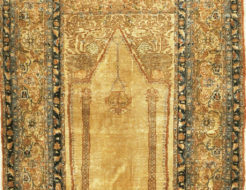 This Fine Heriz Runner displays a distinctive large-scale motif that is eye catching and unique. Such designs are often woven from memory and are rich with history. All hand woven and dyed with natural colors, this work of art will last for years to come. 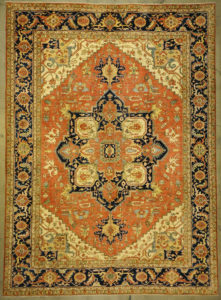 This Finest Heriz Rug is named after the largest town in the mountainous area of northwest Persia. 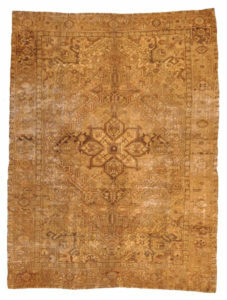 It is said that Tabriz merchants who wanted room size carpets for export asked weavers to make rugs modeled after ancient tribal rugs of caucasus mountains The result is a stunning Heriz carpet, which is an hybrid of rustic village weavings along with a rich classical grand Persian court carpet. 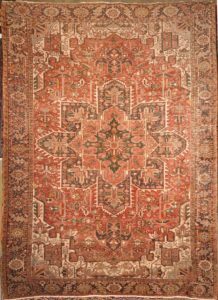 This particular rug is woven with the same natural dyes and handspan wool as it would have been a couple hundred years ago.